SAN MARCOS (11-02-2018) – Palomar, ranked No. 23 in the state in the JCAB Coaches’ Poll, will host another powerhouse on Saturday at Escondido High’s Chick Embrey Field at Wilson Stadium. The opponent: one of the nation’s best rushing teams, No. 12-ranked Cerritos. The Comets will be playing their final home game of the 2018 season. Kickoff for the Central Conference game is slated for 6 p.m. as coach Joe Early’s squad continues its bid to qualify for post-season play in the Southern California Football Association’s National (State Playoff Eligible) Division. Palomar is coming off a tough loss on the road to State No. 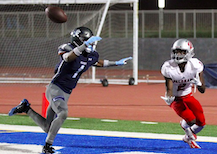 10-ranked El Camino College 42-35 last Saturday night in Torrance. “We’ve got another big challenge ahead of us,” Early said. “We can’t let the loss to El Camino determine how we play Saturday. Cerritos is the top rushing team in Southern California, so our defense will be really tested, again. The offense needs to help out defense out and score points, and our special teams have to be solid. Cerritos’ running game features Rhamondre Stevenson, a 6-foot-1, 230-pound sophomore from Centennial High School in Las Vegas who rushed for 215 yards last Saturday in a 36-14 victory over another ranked team, Mt. SAC. Palomar’s offense features red-shirt freshman quarterback Connor Curry, one of the state’s most dangerous offensive threats both in the air and running the ball. Defensively, the Comets have been led by linebacker Chris Calhoun, a freshman out of Mission Hills High School.